The price is for the popcorn machine itself. For an additional cost, we sell the popcorn kits that contain pre-measured amounts of kernals, oil, and seasoning salt. We also sell the themed bags that you can put your popped popcorn in. Those are priced individually. The popcorn kettle size is 6 ounces. 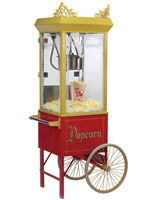 * Please call us with any questions about our popcorn machine with cart rentals in Kennewick, WA and Richland, WA.